Fold-Away Wall Mounted Grab Rail With Supporting Leg. 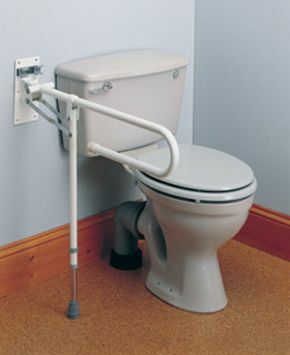 A wall mounted fold away grab rail with added support given by a supporting leg. Ideal for use where a wall mounting alone would provide insufficient support. Leg has a non slip rubber tip and is adjusted using a simple ”E” clip. Rail locks in upright position when not in use.